When you have a better understanding of how soakers work, you begin to have better ideas on how a particular blaster's performance can be maximized when using and enhanced if desired. The following article covers some basic concepts and terms behind various soaker technology. Links to further reading are also provided. Note: this page solely discusses soaker technology and does not cover water balloon launcher technology. There are many common (and not-so-common) terms used when talking about soakers and water warfare in general. For a more complete listing, see the Glossary. For the purpose of this article, though, there are several terms which should be familiar. 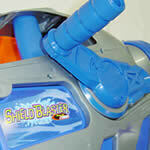 Air-Shot: The action of pumping up a Super Soaker® when its reservoir is empty and firing out he compressed air. Blaster: Short-form of the term: water blaster. Grip: The part of the water weapon held onto by one's hands. On most Super Soakers(tm), there are two grips: one where the trigger is and one for the pump. Handle: See Grip.Some of the newer Super Soakers(tm) have an additional handle on their top for carrying purposes. Mist-Shot: What happens when more air than water is fired from a pressurized firing chamber. Nozzle: The part of the water weapon which has the aperture. Some Super Soakers(tm) have changeable nozzles. Output: The rate of water delivered by a blaster per unit time. Output is typically reported as mL/sec or oz./sec. 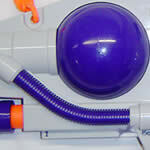 Power Soaker®: The general term used for the pump-action based water blasters Larami Ltd. makes. Q.F.D. : Acronym for the Quick-Fill Device(tm). This device attaches to a standard garden hose allowing all Super Chargers(tm) Super Soakers(tm) to be refilled quickly. 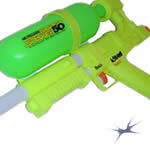 Soaker/Water Blaster: The proper term for referring to a Super Soaker® or other potent water weapon. Strap: Part of some SuperSoakers(tm) which allows them to be carried without needing to use one's hands. 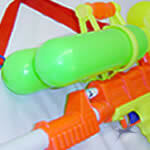 Straps can also be added to virtually any Super Soaker with a little tweaking. 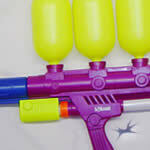 Super Soaker®: The general term used for most of the water blasters Larami Ltd./Hasbro Inc. makes. 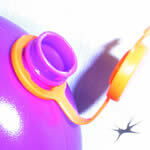 Trigger: The part of the water blaster which, when pressed/pulled, unleashes the pressurized water from the aperture. Soakers come in a wide variety of shapes, sizes, and colours. All soakers work on the principle of accelerating water through some means in order to create a stream (or ball) of water allowing targets to be soaked at a distance. One of the key differences between how well different soakers perform lies in the different methods used to make water accelerate and move in a desired direction. The most commonly found acceleration and pressurization systems are briefly explained. Squirt pistols typically employ a series of ball-bearing-based valves with a spring-based pump (i.e. the trigger rod) found between the valves. When the pump is depressed, pressure exerted in the inner tubing closes the valve at the reservoir intake while opening the valve at the nozzle, allowing water (or initially air) to be pushed out of the nozzle. When the pump is released, the spring returns the pump to the original position. At this time, the reduced pressure in the inner tubing closes the valve at the nozzle while opening the valve towards the reservoir to draw in more water into the pump chamber for the next shot. The system performance is limited since the total pump volume is often quite small while the valves used are also of a small diameter, meaning that overall stream size cannot be made very large. Larger ball-bearing-based valves are less effective at opening and closing when needed and also introduce unwanted turbulence into the stream, thus a different type of check valve is used on larger water blasters. These type of water blasters often do not employ any valves, simply relying on surface tension to hold water within the filled pump chamber. However, blasters with reservoirs do possess valves. For the most part, the pump shaft is typically directly behind the nozzle, thus the power behind the stream relies primarily on the strength of the user. Of course, maximum range even of a piston-based soaker is limited by stream size (i.e. diameter of the nozzle) as well as stream lamination (i.e. smoothness of the flow). Typically, motorized water blasters use a motor to drive a pump mechanism in order to generate the force to pull water from the reservoir and push it out of the nozzle. In effect, the motor does the job that one's trigger finger would do when using a basic squirt pistol. 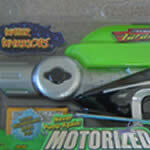 Triggers on motorized water blasters are used to turn the motor on and off. The advantage is that one does not need to continuously pump as the motor does the work, but such blasters are known to drain battery charge rather quickly; newer models feature longer-lasting rechargable batteries. One other shortcoming is that motors used often cannot provide enough pressure to power larger streams, thus limiting maximum output. Motors capable of moving larger volumes of liquid are too expensive and/or large to be used easily in a portable water blaster. Unlike squirt pistols or syringe-type water blasters, air-pressure-based water blasters store potential energy in the form of air pressure. The pump is used to compress air within the reservoir; pressure builds with each successive pump. To shoot, a trigger is used to open the valve between the pressurized reservoir and the nozzle, allowing water to flow forth. A safety valve is added to the system to prevent over-pressurization and tank and/or tubing rupture. Use of pressurized water allows for much longer shot times as well as larger streams to be produced. The drawback to having a pressurized reservoir system is that the entire internals must be water and air tight when the nozzle valve is closed to allow pressure to be built up when pumping; this also means that one must be careful and depressurize the blaster before opening the reservoir to refill. As well, the reservoir cannot be filled completely, otherwise there is not enough space to build up sufficient pressure to produce a decent stream; in general, reservoirs should be filled to no more than 3/4 of its full capacity. Lastly, when water levels drop, if the intake tube is no longer submerged beneath water when firing, one will generate a mist shot, releasing the pressurized air as opposed to water from the nozzle. Depending on the placement of the intake tube as well as the angle one is firing, one can produce a mist shot when there is a fair amount of water remaining in the reservoir. Mist shots mean more pumping is required to regain the lost pressure in order to yield optimal stream performance. Unlike pressurized reservoir systems, separate firing chamber water blasters have a dedicated chamber to house the pressurized air and water. This offers multiple advantages. Firstly, as the pressure chamber is typically a smaller volume compared to the size of the reservoir, less pumping is needed to gain optimal firing pressure. Secondly, by separating the firing chamber from the reservoir, the reservoir remains at atmospheric pressure and can be completely filled, maximizing capacity. Mist shots are still a problem, though, for separate firing chamber water blasters and one still needs to be careful when attempting to shoot at extreme angles. Split Air vs. Water Pressure Chamber system blasters use a novel technology to divide the compressed air from the water in the firing chamber by using a sliding piston. Like separate firing chamber water blasters, the split air/water chamber blaster reservoirs can be filled completely as they are not pressurized. However, as the air and water do not mix in this firing system, there is no angle limitation when shooting and no risk of mist-shot. Angles do matter, however, when pumping as the water intake must be submerged beneath water for water to be drawn into the pump. The CPS system is set up similarly to the separate air pressure chamber system, but instead of relying on air pressure, water is pressurized from the elastic nature of the rubber bladder; as the rubber is stretched, it exerts elastic contractile pressure to the water within. Due to the nature of elastic expansion and contraction, the amount of force applied to the water in the bladder throughout the contraction phase is nearly constant, hence giving this system the name: Constant Pressure System (CPS). As well, as air pressure is not the driving force, there is no problem with mist shot production; there is also no angle restriction when firing, but one needs to ensure the reservoir intake tube is beneath the water level during filling of the pressure chamber. There are two varieties of CPS-chambers: a spherical chamber and a cylindrical chamber. The Hydro Power system is similar to the CPS system in that is also uses the elasticity of rubber to provide the force behind the stream. However, unlike the full CPS system, the Hydro Power system has a rubber diaphragm stretched over a housing; as such, the bladder exerts notably more force when more fully expanded and the resulting stream pressure suffers from higher drop-off as the chamber contracts. However, for the majority of the contraction process, the system does behave like a CPS system and is thus classified as such. As well, like the CPS system, there is no angle limitation when firing and no problems with mist shots. Spring-based systems use the contraction or expansions properties of metal springs to provide the driving energy behind the stream. While, in theory, these systems could be made to rival the power output in CPS and/or diaphragm systems, spring-based systems have not been used extensively in water blasters; present spring-based blasters are only capable of limited output and shorter ranges due to the spring strength they possess. Peristaltic pumps are based on rollers that pinch a soft piece of tubing; as rollers are rotated, they squeeze water in the tubing and push it along the length that the rollers remain in contact with the tubing. As pumping requires the tubing to be continually compressed, wear is inevitable. Additionally, tubing diameter used cannot be too large otherwise there may be difficulty for the rollers to properly seal the tube and push the water forward. Moreover, if the pump is not in motion, there would be no flow, hence continuous pumping is required to produce a stream. There are a variety of nozzles and nozzle-selector designs found on various water blasters. This section will discuss some of the more commonly found nozzles and nozzle selectors seen. Stream nozzles are the most basic nozzle type. Stream nozzles are designed to focus the flowing water coming forth from the nozzle into a stream; in stream form, water is able to be propelled the furthest through the air as streams have the least air resistance. Of course, not all stream nozzles are equal. The better stream nozzles offer better stream lamination, thus making the flow from the nozzle very smooth and solid. Poor stream lamination results in some unwanted outward spraying of the stream and earlier stream termination as the stream ends up breaking into component droplets. There is also the difference in initial stream diameter which is dependant on the nozzle diameter. Larger stream nozzles are capable of producing larger streams, but this is only true if there is both enough flow and force behind the stream as well as proper lamination leading up to the nozzle. Fan nozzles are either thin in one dimension and long in the other or made up of a linear array of small openings to produce a fan-shaped blast. In most cases, the fan pattern created is flat, parallel to the ground. However, there are some water blasters that produce vertically oriented fan blasts. Fan blasts allow a wider area to be covered by the stream, but this comes at the price of range. Shower nozzles are composed of numerous small openings to yield a large number of small, spreading streams. The result is a wide blasting spray area, but as with the fan nozzle, shower nozzles lack the range of streams. A water blaster needs to have a large, good strength pressure chamber for shower nozzles to be of use, otherwise the shower setting will feel rather underpowered when firing. A Riot Blast is the term used for a large, completely non-laminated blast of water. The first use of the term "riot blast" referred to the removal of the stream nozzles on older water blasters such as the Super Soaker XP 75 and Super Soaker XP 150. Later soakers, namely the Super Soaker Flash Flood and Super Soaker Arctic Blast, were given dedicated large, low cohesive-blasting nozzles termed 'Flood Nozzles'. Riot Blast nozzles achieve a similar effect to Shower Nozzles, but seem to have slightly more power behind the blast as the water is not constrained into a specific shape by a shower nozzle screen. The Typhoon nozzle setting is found on the Super Soaker CPS 3000 and Super Soaker CPS 3200. The nozzle pattern yields three, poorly laminated streams that spread out in a pyrimidal pattern away from the center. The effectiveness of this nozzle is questionable as the three streams diverge rather quickly, making it difficult to hit a single target using multiple streams. At the same time, the spread is not wide or encompassing enough to be used effectively against groups. 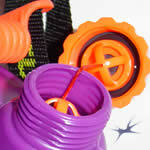 The Aqua Storm nozzles can be found on the Super Soaker Monster X and Super Soaker Monster XL. The nozzle pattern has four small slits in a square-type layout. The resulting stream appears like a slightly increased area stream (or like a hollow, wider stream). Interestingly, range of this stream setting is not significantly affected while impact area is increased. 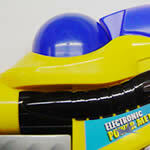 Pulsing nozzles are found on water blasters such as the Super Soaker XP 90: Pulse Fire and the Super Soaker EES Turbine. When on pulse setting, the otherwise continuous stream ends up staggered by the nozzle into water pulses akin to the pulsed streams produced by earlier motorized water blasters. Interestingly, pulsing of air-pressure-generated streams does not affect range (and, in some cases, seems to slightly extend the range). As well, it does help to conserve water usage, though, of course, coming at the price of lower output and yield. Rotating nozzles are found only on a couple of water blasters, namely the Super Soaker Helix and the Water Warriors Crossfire. The two nozzles on their own are actually simply stream nozzles, but are mounted on a housing that rotates them in a spiralling fashion as the water blasters are pumped. The end result is a helix-type stream that covers a larger area without the blaster user needing to reposition the stream. As expected, range is diminished as the rotating streams lack the coherence a solid stream has, thus affected by increased air resistance. 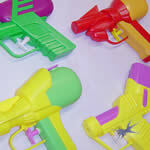 When a water blaster has more than one nozzle type to choose from, there is a need for a nozzle selector device. The following is a listing of commonly found nozzle selections. Perhaps the simplest way to change nozzle settings is simply to attach different nozzle patterns onto a blaster's nozzle opening. 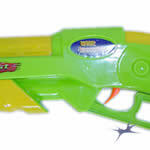 While not an intentional design, blasters such as the Super Soaker XP 75 could be toggled between stream setting and riot blast mode simply by attaching or removing the stream nozzle. The main problems here is that changing between settings is a slower process as nozzles need to be unscrewed. As well, detached nozzles can be lost. Another one of the simplest ways to select between nozzles is simply to have a different valve to control different nozzles. This, however, would increase the cost and complexity of a water blaster as a separate trigger, valve, and tubing would be required for each addtional nozzle option a blaster has. As such, separate nozzle valves are typically found on blasters offering only two or three nozzle selections (i.e. on the Super Soaker Max-D Secret Strike and the Super Soaker Flash Flood). The rotary nozzle selector is the most commonly found means of allowing different nozzles to be used. Basically, different nozzle settings are arrayed on a disc that can be rotated. 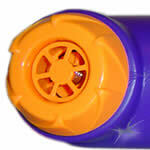 The selected nozzle is the one that ends up aligned to the water blaster's true nozzle where the water is expelled. The main drawback to this design is that if a nozzle is not aligned well, stream performance is reduced or stopped altogether. A switch selector is simply a tubing flow diverter that directs water from a pressure chamber to one or another nozzle. One of the most elegant switch designs can be found on the Super Soaker CPS 1-3-5; on that blaster, the further the trigger is pulled, the more nozzles were activated. 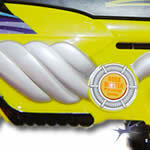 A more standard design can be found on water blasters such as the Super Soaker Aquashock Hydro Blitz. There, a bottom-mounted swtch can be toggled to select either the stream nozzle or the Flood nozzle. Apart from the spray pattern, available water pressure and volume, the other aspect that affects stream performance is the size and shape of the nozzle valve. Good valves offer smooth water flow and introduce little or no turbulence into the stream. The type of valves are commonly found on small squirt pistols and are comprised of a small ball bearing mounted within a shaped housing. When water is attempting to flow, the ball-bearing is pushed in the direction of the flow. In one of the directions, this motion ends up sealing the valve closed; in the other direction, gaps are designed into the housing to allow water to still flow around the ball bearing. This sort of valve only works for small diameter streams as a larger ball-bearing valve would suffer from too much leakage due to poorer sealing. Pinch valves are comprised of a spring-loaded device designed to pinch closed a soft piece of tubing to stop flow. The original Super Soaker SS 50 and its initial successors utilized the pinch-trigger system quite well. The main problem with this valve design is that the valve does exert stress onto the tubing, deforming the tubing and adding in unwanted turbulence. As well, larger tubing could not be used as well as sealing difficulties arise as the internal diameter increases. Of course, as the tubing is simply pinched closed, the seal is not as tight, thus higher pressures will force water through. This system works in the same way as the ball-bearing system except that spring-loaded valves replace the ball-bearing valves. This allows for larger amounts of water to be displaced as the valve can be easily scaled in size, but it suffers due to introduction of stream turbulence due to the geometry of the open valve..
CPS and SC Super Soakers(R) employ an enclosed-trigger valve system. This trigger/nozzle system is housed within a solid piece at the front of the blaster and works similarly to the pinch-trigger system. In this case, the pinch-trigger is replaced with a spring-valve which is opened upon pulling of the trigger. The end result is a sturdier trigger-valve assembly, but the trigger is still analog and the amount it is opened depends on how far the trigger is pulled. Most modern soakers now use ball valves at the nozzle to control flow. Ball valves are comprised of a large ball-shaped device with a channel cut through it that can be rotated from an open to closed state and back. The nice aspect to this design is that, when fully open, water can flow unimpeded through the valve; for increase flow, a larger ball valve can be used. Thanks to its geometry, ball valves will not open due to increased amounts of pressure. However, ball valves can be opened to varying degrees depending on how far they are rotated; in the semi-open state, the shape of the opening can introduce turbulence into the stream as well as restrict flow in general. The Max-D Trigger/Valve system was introduced in 2002 by Hasbro Inc. Basically, the Max-D system is a modified ball valve set-up that is spring-loaded to toggle between fully open and fully closed. This binary-style opening and closing maximizes water pressure from the water blaster, yielding better performing streams in general. However, Max-D triggers are also known for being weaker, in general, with their more complex valves failing to work when the springs lose their ability to properly open and/or close the valve. Most water blasters have reservoirs. In the case of syringe-type water blasters and pressurized reservoir blasters, the reservoir is the firing chamber that must be pressurized in order to generate a stream. In other cases, the main purpose of the reservoir is to store additional water that can be moved into the pressure chamber for additional full shots. The size of the reservoir determines how many times the firing chamber can be completely filled while the position of the reservoir affects overall blaster balance; top-mounted reservoirs often can use their contents effectively, making use of gravity to assist in guiding water from the reservoir into the intake. However, top-mounted reservoirs make water blasters feel more top-heavy due to the weight of the water, thus affecting blaster balance. Bottom-mounted reservoirs lower the center-of-gravity on a blaster, making it easier to hold a blaster vertically. However, moving the reservoir farther from the pressure chamber means longer intake tubing is required to draw the water from the reservoir and this affects the rate at which a blaster can be pumped. Lastly, reservoir shape affects how much of the water within the reservoir is actually usable and not simply unusable dead-weight. Full Body Reservoirs are typically found on small squirt pistols wherein the body of the water gun is where the water is housed. This design maximizes available water storage space within the squirt pistol, but also requires for the pistol body to be water-tight; any crack in the body will result in leaking. Such reservoirs are not used in larger soakers possibly due to the difficulty in needing to seal a much larger area as well as the fact that full body reservoirs inevitably must submerge all of a blaster's internals in water. For small squirt pistols that are not meant to last long, there are not too many parts that could be serviced in the event of problems. However, for a larger water blaster, the increased complexity of the internals could be adversely affected if continually submerged in water, particularly if the water used has higher salt content (i.e. may cause rusting) or small particulates (i.e. may jam moving parts). Early Super Soakers (i.e. Super Soaker SS 50 and Super soaker SS 100) as well as some other water blaster brands use bottle-shaped reservoirs that are attached to the body of the water blaster by a threaded screw-top. One nice thing about the bottle design is that bottles could be detached from the blaster and filled from sinks or in a deep bucket of water. The drawback to this design, though, is that the bottle threading and seal would wear down over time. As well, the weight of the filled reservoir would be primarily supported by the neck of the bottle, leading to increased stress at the point of attachment. Moreover, to draw water from the bottle, an intake tube would need to be threaded into the bottle, but such tubes are never able to make complete use of the reservoir content, hence resulting in unusable water to remain. Capped Reservoirs are reservoirs that are built as part of the water blaster and can be filled via a fill opening. By being built as part of the blaster, these reservoirs are generally much more stable than the Bottle-Type reservoirs. However, reservoir shape and placement of the intake tube/hole still affect how much of the reservoir's capacity can actually be used for firing. The main technological difference between various forms of capped reservoirs lies in the nature of the cap used to seal the fill-hole. As the name suggests, snap caps close the reservoir fill hole by snapping into place. While these caps can be tethered or not to the blaster's body, the seal provided by these caps is often not very tight, thus some leakage can occur if the blaster is held at some angles. These caps are also more easily accidentally opened if the cap is not snapped on tightly. Threaded caps are the most commonly found caps on modern water blasters. As the name implied, caps are attached by screwing the cap on via its threading. Good threaded caps include some sort of O-ring to provide a better seal on the fill opening when the cap is tightened. Threaded caps can also be tethered to the blaster or be completely removable depending on the design. One important feature a threaded cap must possess in separate firing chamber blasters is a one-way valve to allow air to enter. Without the ability to let air in, reservoirs will collapse under the vaccuum that is created as water is drawn into the pressure chamber. Of course, caps on pressurized reservoir blasters do not need this air-inlet. Fast-Fill Caps were introduced by Hasbro Inc. in 2004. They are basically threaded caps with a much larger one-way valve that can be used to fill the reservoir with water without needing to remove the cap. However, these caps did not always work for all as easily as they were meant to. Thankfully, they could still be unscrewed and opened as regular threaded caps. 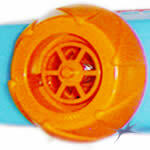 Max-Infusion Caps were introduced by Hasbro Inc. in 2006 and represented the next step in their Fast-Fill cap design. These caps were threaded backwards (i.e. left-handed threading as opposed to the regular right-handed threaded) in order to tighten further upon attachment of a Max-Infusion Aquapack reservoir extension. The ability to add on an external backpack reservoir to the blaster meant that reservoir capacity could be extended by one to three litres without needing to modify the blaster. As the name suggests, backpack reservoirs are water blaster reservoirs in a backpack-type format. The advantage of this is that the weight of the water ends up distributed on one's shoulders as opposed to one's arms. This allows more water to be carried yet still be managable; as such, many backpack reservoirs hold significantly more water than blaster-mounted reservoirs. 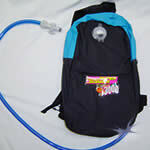 However, backpack reservoirs need to have tubing to attach to a water blaster for its water to be used. The tubing and joints are a common point where leaks can occur. As well, needing a tube to connect to the blaster limits the range of motion of the blaster depending on the length of tubing available. While the additional capacity is welcome, it also comes at the price of a longer and more involved refilling procedure; most backpacks need to be removed from the user in order to be filled, thus leaving one even more vulnerable when refilling the reservoir. While stream performance, output, range, and capacity are the primary things many water warriors look for in a water blaster, they should not be the only things to consider. Other additional features found on a water blaster can forther improve a blaster's overall effectiveness. For mid-to-large-sized blaster, the addition of a top-mounted carrying handle often helps when either transporting and/or refilling the soaker. Basically, having a defined area one can grab and support the entire blaster's weight when refilling will help the process significantly. For small, pistol-sized water blasters, a holster, if available, makes carrying additional blasters and/or equipment much easier. As for medium to large sized water blasters, straps both make the blaster easier to carry as well as offer additional stability when firing. Straps should be thick enough to be comfortable, adjustable to accomodate a user's height, and be attached securely to the blaster such that it will not come loose during the heat of the battle. Fill gauges are common on older Super Soaker CPS blasters and allow a user to quickly tell how much water remains in the firing chamber; sadly fill gauges are not common on many soakers that could have benefitted from having one. Fill gauges can also be quite useful on reservoirs to allow the user to easily determine how much water remains. Pressure gauges appearred on a handful of older Super Soakers as well as many of the Water Warriors water blasters in an electronic form. Pressure gauges help users determine whether their blaster is at optimal pressure, though, in general, users tend to simply continue to pump so long as there is water in the reservoir and that the pressure-release valve has yet to be activated. However, for separate pressure chamber blasters, pressure gauges allow a user to determine how well a firing chamber has been pre-charged with air before filling the pressure chamber with water. 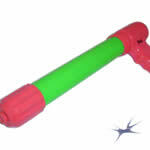 Some water blasters offer the option of extending some shielding from the blaster's body. Shielding, of course, can be used to deflect incoming streams and help keep the user dry. The effectiveness of shielding is limited, though, as it typically requires a user to go into a defensive stance, unable to counter-attack immediately, as well as a shield can only protect a small portion of the body at a time, making a user defenseless against attacks from multiple angles if relying on shielding alone.